The shop is large and inviting. 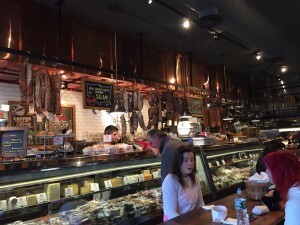 The deli counter stretches down the length of the room with hanging salamis above and assorted meats and cheese below. I sampled two of their artisan cured meats, as well as a homemade everything bagel chip while I eagerly awaited my pastrami sandwich. 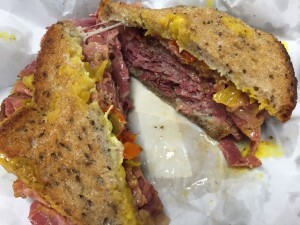 It is named "The Katz," as a homage to the king of pastrami sandwiches in NY. 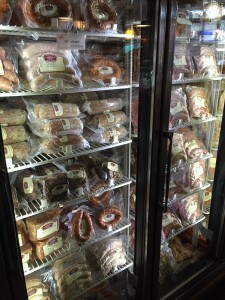 On the opposite wall, the refrigerator case contained dozens of sausages and homemade stocks and sauces. By the time I got the sandwich back to my desk, it was a little smushed and the butcher paper was soaked in grease. To be fair, they warned me that the sandwich would not travel well. The pastrami was everything the reviews promised – tender, succulent thick slices of glossy cured deliciousness. The sandwich was served with a mustard pickle relish and Swiss. The relish was added a little extra kick but I'm a pastrami purist so I scraped it off the second half of my sandwich. It was an excellent sandwich, worthy of the name. The sandwich is pricey at $12.5 , but it's cheaper than a trip to NYC.